When I was about ten years old I had a seed planted in my head by my grandfather who told me often that I should become an architect. He must have programmed me well for I do not remember considering any other possibility. My high school drafting teacher gave me special architectural projects in lieu the standard curriculum. My five years at Miami University of Ohio were not particularly inspiring, but was somewhat counter-balanced by my passion for running track and cross country. Soon after graduation in 1956, with a Bachelor of Architecture degree, I moved to Fort Lauderdale, got married and went to work for Robert Hansen, Architect. Two and a half years later I became a registered architect in the State of Florida. Six months after that, in June 1959, I started my own practice in a $50 per month second floor rental space, overlooking an alley. It was not until then that I began to become aware of organic architecture, and the method of intuitive discovery by which it is realized. House Beautiful magazine was my main source of inspiration as Frank Lloyd Wright houses were often featured, and in great detail. Alfred Browning Parker, in south Miami, had entire issues devoted to several of his houses, which were called Pacesetter Homes. I was also influenced by Paul Rudolph in Sarasota and Fay Jones in Arkansas, who were just beginning to get published. 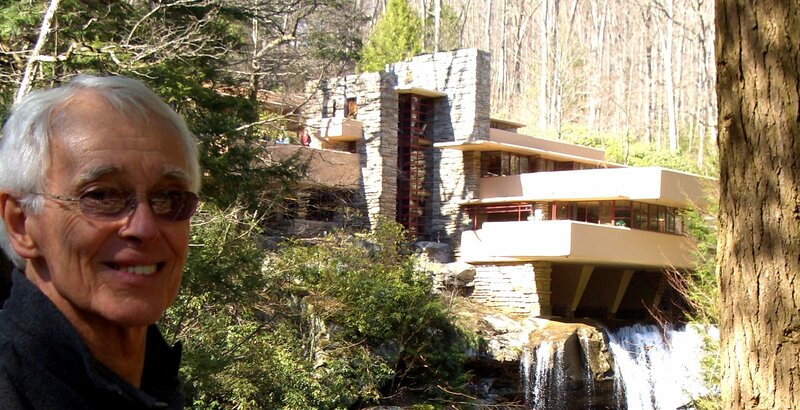 But Frank Lloyd Wright was the main source of inspiration, as his articulation of “organic” architecture and the many well documented examples were plentiful. By the time I began designing my own office building in 1961, I had begun to identify an architectural vocabulary that I could think of as my own. I moved into my new office in June 1962, and by 1967 I had gotten divorced and remarried, with three new children, added to the two from my previous marriage. A sixth one surprised us four years later. Fortunately, the office building also included four rental spaces, conveniently unoccupied, so we remodeled into expanded family living quarters. I then became totally committed to the live/work life style. In 1983 we bought fifty acres in Cashiers, North Carolina and built a small cabin and a barn, which was basically a summer place. In 2001 we made the decision to move our home and my architectural practice permanently to Cashiers. The barn was then remodeled into my office/studio on the ground floor and a guest house in the hay loft above. I have enjoyed a diverse career, from a relaxed one man residential practice to a hectic but efficient and professional commercial/hospitality practice. Each one seemed right at the time. My assistants have varied from one to eight. In the 60’s there were one or two and in most of the 70’s I worked alone by choice. I designed my first restaurant in 1968 and by 1978 had completed twelve restaurant/bar projects and had begun to get a reputation for successful hospitality design. My first assistant, after eight years as a one man practice, proved to be a great asset, and his knowledge and skill allowed me to expand and take on more work than I had ever believed possible. During the next twenty years there were usually three to seven assistants, and by 2001 we had completed seventy seven restaurant/bar projects. Houses, however, remained my first love, but accepting new house clients became compromised during those hectic years when hospitality projects consumed all of our time and energy. We did manage to do twenty some residential projects though during those twenty years. The restaurants were fun, challenging and technically demanding, but we got good at the nuts and bolts, which allowed me to concentrate on design, materials, furnishings and decor. The common purpose of these projects, as I saw it, was to uplift and entertain, so that was the goal, but always within the context of organic architectural principles. The next phase of my office/practice was our move to Cashiers in 2001. I remodeled the lower floor of our barn into my ideal environment for creative expression and work. In peaceful solitude, surrounded by nature and three miles from town, I once again work alone. I still draw by hand, and when necessary for larger projects, I use contract CAD assistants and consultants. I have done just over five hundred projects. I have tried to be realistic and practical concerning budgets and methods of building to meet those budgets, and have refused jobs that threatened a risk of failure. Consequently, seventy percent of those jobs have gotten successfully built. Interiors and landscaping were automatically included as integral to the design of all projects. Typically, numerous built-ins lead naturally to the appropriateness of interiors and structure as one whole idea. About 1980 I started a purchasing company and developed an interior library of residential and restaurant furnishings, fabrics, carpet, etc. Having all of that at my fingertips allowed interior decisions to start early and flow smoothly. Landscaping has been somewhat of a “seat-of-the-pants” process as I have never figured out how to do landscaping on paper. I select and place the material myself, usually in several hard working sessions with a crew to do the planting. . . . . . trees and boulders first, then to the medium size plants and finally ground covers and grass. It’s a very spontaneous process, but always based on a conceptual idea which also includes the client’s choices of favorite trees, plants and flowers. If asked to describe my philosophy, truthfully I would have to confess that I have none. If pushed for an answer I would have to respond that “My philosophy begins at the end of my pencil.” What that means is only that I have no self imposed framework of rules, but I do have a commitment to an Infinite Creative Mind, and that this Universal Mind includes all that is, or ever could be, known or created. My link to this Creative Mind is Intuition, which never shouts, but whispers so faintly that I find the most effective receiving devise is the pencil in my hand, together with a specific intention and a desire to produce a product. The result is more like discovery than it is personal creation. If I am free from preconceptions or tradition it always comes in terms of geometry which results in abstraction. But architecture is for people and not just an abstraction. Therefore I think of my function as being that of an interpreter, receiving the uniqueness of my client in one language and translating it into another. . . . . . the language of organic architecture. The means for this is abstraction, the arranging of geometric forms, or parts, into relationships that promote the clarity of each part while contributing to the unity of the whole. Simplicity, clarity and order are the primary ideals. . . . . . . not the rationing of parts, but order brought to complexity, resulting in simplicity. Geometry gives us the basic primal shapes and forms that are found throughout Nature. Therefore “organic” architecture is naturally appealing because of its subjective quality, which is sensed as a “feeling” (beauty, happiness, delight, harmony, love). By contrast, traditional architecture relies mostly on familiarity and memories. The main theme, however, that runs through this manipulating and ordering process is the appropriateness, comfort, convenience, safety and well being of the people using the space within. There is never a necessity to sacrifice any of these, for they are the reason for building. The attraction in a work of organic architecture lies in its spirit. You strive to create an uplifting environment that not only makes one conscious of its beauty, but unconsciously sensitive to its energy. Such a place, because of its beauty and energy, draws you back with its delightful promise. Organic architecture can be further characterized as. . . . . . spontaneous, personal, peaceful, cohesive, relaxed and free, flowing from a sense of site, harmoniously proportioned, a quality of function and beauty, sometimes extravagantly complex, in tune with nature, provocative, enriching. Romantic Naturalism + Geometric Abstraction = Balance.